Common sow thistle is in the Compositae (Asteraceae) family. This is a nutritious plant that contains several minerals (calcium, magnesium, iron, phosphorus, sodium, potassium and zinc) and vitamins ( A, B1, B2, B3, B6, & C). The leaves are also great to use as an antioxidant. 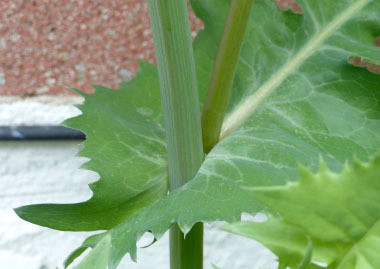 Distinguishing Features: Common sow thistle has hollow stems that exude latex if damaged. It has a short taproot, and deeply lobed leaves. It can be distinguished from Sonchus asper and Sonchus hydrophilus in that they both have stiff and leathery leaves, mostly smooth achenes (fruit) with ribs that are rough to the touch or with hairs. Sonchus oleraceus has soft, thin leaves and wrinkled achenes, with ribs but without hooks. Flowers: Yellow flowers and are 5-6mm (less than 1”) in diameter and appear on stalks at the ends of branches, in an irregular terminal panicle. The seeds are light with white parachutes of silky hairs (pappus), the silky hairs being 5-8mm long. 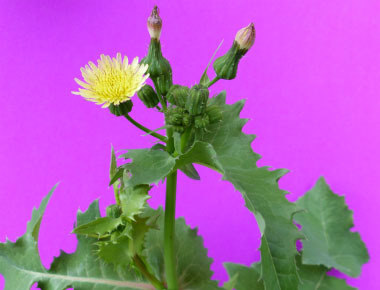 Fields of Nutrition has medicinal benefits and vitamin/mineral content of Common Sow Thistle. Leaves: The first leaves (cotyledons) are round with a slightly toothed margin with a few spines. They have sparse hairs on the upper leaf surface. 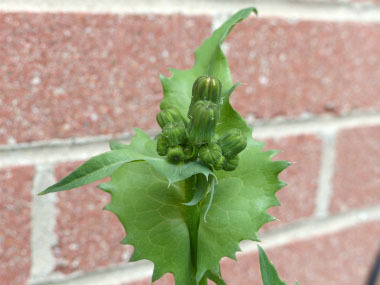 The mature leaves are thin, soft and dark-green in colour with irregularly-toothed margins ending in small, soft spines. They become increasingly lobed with maturity. 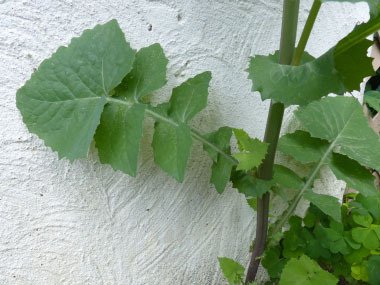 The lower stem leaves can be up to 25cm (10”) long. Height: It grows anywhere between 30 and 110cm (11” – 45”) high. 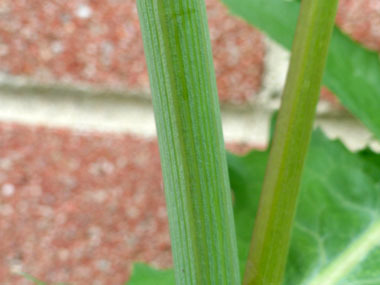 The stems are a 5 angled hollow stem that is dark green (sometimes tinted with a reddish-purple tinge). 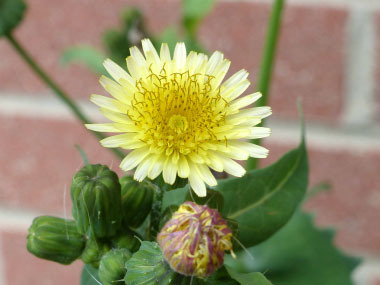 Habitat: Common sow thistle likes most soil types, fields, pastures, roadsides, gardens and edges of yards, vacant lots, construction sites, and waste places. Disturbed areas are places of strong preference. Native to Europe, they grow in many countries around the world. Edible parts: Earlier in the season this plant tastes nice. Leaves and flowers can be added to salads, cooked like spinach or used in soups, casseroles, etc.. The leaves contain vitamin C, protein, fat, and carbohydrates. Cook stems like asparagus. They taste better if the outer skin is removed. Young roots can be cooked as well. 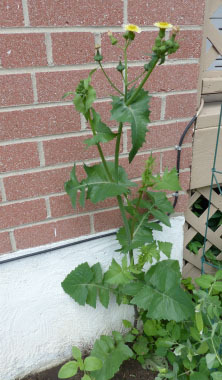 Other name: Annual Sow Thistle. Similar plants: Sonchus asper, Sonchus arvensis.